Chris Boyd is preparing his Saints players for a 'tough assignment' at Sale Sharks on Saturday (kick-off 1pm). Boyd's men head north on the back of a brilliant 36-17 success against Wasps at Franklin's Gardens last Saturday. It was the best performance of the season so far from the black, green and gold, who returned to Gallagher Premiership action with a bang. And they will now aim to maintain their momentum when they travel to the AJ Bell Stadium to face a Sale side who were beaten 31-25 at Saracens last Saturday. "It is a tough trip, so they tell me," Boyd said. "I'm not totally used to the Premiership yet but everyone tells me Sale is a real tough assignment. "They pushed Saracens really hard last Saturday and it's really tough for us. "We've got some self-belief from last Saturday and we need to back up our performances. "We go there knowing it's going to be a really tough assignment." 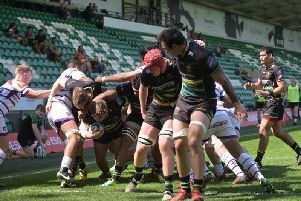 Saints scored five tries against Wasps at Franklin's Gardens, creating a winning formula that contained a potent blend of talented youngsters and senior squad members. And Boyd, who took over at Saints after leaving the Hurricanes during the summer, said: "It's a work in progress. "The game our players have tried to play is a bit different to what they did last year so there have been some teething pains. "It's about getting everyone's head around it and getting the skill execution under pressure. "We're a long way from being complete, but last weekend was a pretty good indication that we're making some strides."